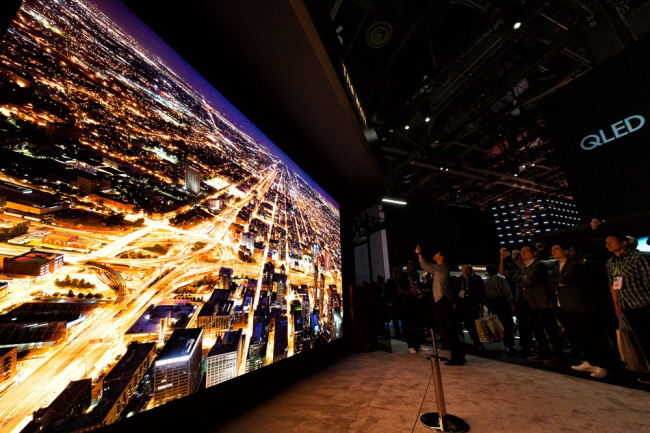 LAS VEGAS -- The Consumer Electronics Show, the world’s biggest technology showcase, officially kicked off in Las Vegas on Tuesday, showcasing the latest technology innovations from big companies and startups across diverse product categories. This year’s event features more than 4,500 exhibiting companies, including a record 1,200 startups, while more than 20,000 products are being launched on the show’s floor, according to the Consumer Technology Association, the organizer of CES. From high-end TVs and folding smartphones to artificial intelligence technologies, the fifth-generation network, virtual reality and robots, the tech show touched on the biggest themes leading today’s tech developments, with flashy company booths and technology demonstrations. South Korean tech giant Samsung Electronics has a strong presence in the tech show, rolling out its “Samsung City” equipped with “districts” that each show off the firm’s newest TVs, monitors, home appliances and AI technologies. A definite attention-grabber at Samsung’s booth was the 219-inch, 6K version of Samsung’s modular Micro LED display, dubbed The Wall. Samsung’s Bixby-enabled smart home as well as AI-powered robots, announced at this year’s CES, also drew keen interest from spectators. Nearby, the LG Electronics booth wowed visitors with a flashy set of organic light-emitting diode screens resembling a waterfall. Inside, visitors were most impressed by LG’s rollable OLED TV, which the firm plans to commercialize in the latter half of 2019. 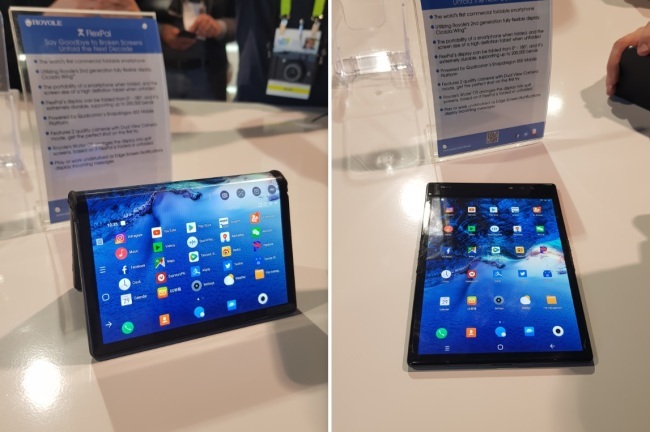 In the smartphone arena, China’s Royole stole the spotlight with the world’s first commercial foldable phone with a flexible display, the Royole Flexpai. There were long queues of people waiting to test out the folding phone, deemed as the latest big-scale innovation to smartphones. Meanwhile, Google and Amazon went head-to-head in the area of smart voice assistants, each showcasing the benefits and applicative value of their respective products, the Google Assistant and Amazon Alexa. During CES 2019, Google announced a series of new features to the Google Assistant, including an “interpreter mode,” which supports real-time translation in 27 languages, and Google Assistant Connect that makes it easier to pair regular devices with Google Assistant. The new additions came as Google seeks to further expand the reach of Google Assistant against Amazon, which is leading the market with its voice assistant Alexa. But Amazon does not seem to be slowing down on its part. 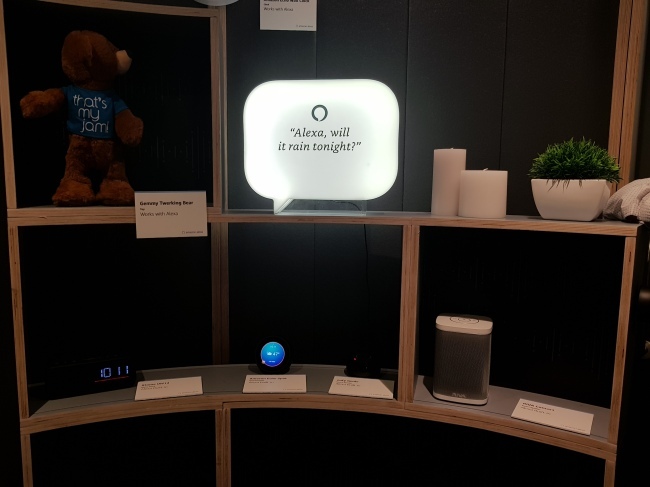 At CES, Amazon prepared an independent exhibition zone dedicated entirely to demonstrating life in a smart home powered by Alexa-enabled devices that are already available in the market. A flurry of companies developing artificial intelligence technology solutions, including autonomous mapping programs, facial recognition software, virtual reality and artificial reality also took up a large part of the conference floor, alongside big software giants like Qualcomm and Intel. Robots serving various functions were an inevitable presence at this year’s CES as well, ranging from the educational bot Kano and Ubtech’s humanoid service bot Walker to an autonomous window-cleaning robot from Chinese robot maker Hobot and AI-powered robots designed for gaming. While electronics, home appliances and tech gadgets are considered the crown jewels of CES, other big trends in tech were highlighted during the show, most notably digital health care. Signaling widening interest in the marriage of technology and health care, companies building digital health devices, wearables and wellness devices featured at the Venetian and Sands Expo drew as much foot traffic as the main exhibitions. A flurry of early-stage technology startups from around the world also got a chance to tout their products to visitors and potential investors at the Eureka Park exhibition space arranged for budding startups. In addition to the introduction of new, cutting-edge technologies, this year’s CES saw another notable change -- less of China. China’s presence at the tech show has waned, in an indication that trade tensions between the US and China has spilled over to the industry side. According to the CES exhibitor directory, around 20 percent fewer Chinese companies are attending this year’s show compared to last year. Chinese telecommunications firm ZTE, which was banned from buying American technology parts last year, did not attend this year’s CES. Moreover, Huawei Technologies’ CEO gave the keynote speech at CES last year, but no executives spoke during this year’s event. However, Huawei is still running a large-scale booth at the tech show. This does not mean China has scaled back its presence at CES. China’s big tech firms, including Hisense, Alibaba and TCL, flashed their technologies in the main hall, while Chinese automaker Byton, AI voice recognition software leader iFlytek and others continue to draw big crowds at the show. “Chinese companies are concerned about tariffs from the trade war,” Shaun Rein, managing director of Shanghai-based China Market Research Group, told South China Morning Post. CES 2019 runs in Las Vegas, Nevada, through Friday.